NATIONAL police have arrested 27 used car dealers for dialing back cars’ odometers to sell them at a higher price. The investigation began after a man bought a car in Toledo thinking it had undertaken a total of 87,000km, only to find out it had actually travelled 207,000km. Since this incident, 48 falsified cars – from 24 dealerships – have been found in five provinces. Authorities have reported that only a small percentage of falsified cars ever get discovered by their owners. 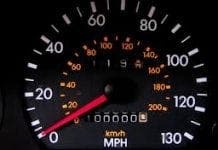 The equipment needed to turn back odometers can be bought online for as low as €100 – roughly 10% of the profits dealers stand to make from dialing back the numbers on just one car. Used car sales are up 4.5% from last year, putting a record number of Spain’s population at risk for being scammed. According to the Federation of Associations of Automotive Dealerships, two used cars are bought for every new car purchased in Spain. Used car owners can protect themselves by looking up the kilometrage records on any car’s inspection reports, now tracked by the National Department of Traffic.